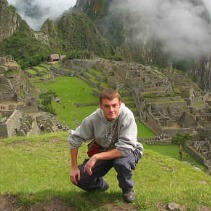 Zachary Parker (Peruvian Forensic Anthropology Team - EPAF): Zach graduated from the University of Pittsburgh with a B.Sc. in Industrial Engineering in 2004. During his undergraduate studies he spent six months studying engineering in Toulouse, France and another six months studying Spanish in Santiago, Chile in 2004. He also worked at the Study Abroad Office at his university. Between 2004 and 2006, Zach then spent two years working as a Peace Corps Volunteer in Malawi, teaching Math and Science at a rural secondary school. After returning from Malawi he worked for UNICEF at their headquarters in New York. At the time of his fellowship, Zack was pursuing a Master’s degree in International Development from American University in Washington, D.C working as a research assistant for Partnership to Cut Hunger and Poverty in Africa (PCHPA) in Washington, DC.